Whether Baltimore is your destination, or just a stopover en route to our nation’s capitol in Washington an hour away, “Charm City” offers a lot to its 12 million visitors each year. Baltimore’s historic Inner Harbor is the site of the restored 1797 U.S.S. Constellation, surrounded by Harborplace and The Gallery, dozens of quaint, trendy shops located in glass enclosed pavilions. Something is always going on at the waterfront; jugglers, unicyclists, clowns, mimes, guitarists and impromptu performers, as well as Holiday firework displays and open-air concerts. Paddleboats, water taxis, and cruise boats will transport you to Annapolis, home of the U.S. Naval Academy, or Fell’s Point, the oldest section of Baltimore with cobblestone streets and bohemian style shops. The harbor also houses the National Aquarium in Baltimore and the Maryland Science Center. Nearby Port Discovery is an exciting, hands-on museum for kids of all ages. The roots of Baltimore’s Jewish community can be explored at the Jewish Museum downtown, comprised of the Lloyd Street and the B’nai Israel Synagogues. Built in 1845, the Lloyd Street Synagogue, third oldest synagogue in the U.S., served the German speaking Jewish immigrants. Its elegant Greek Revival architectural design has a women’s balcony, stained glass windows, chandeliers dating back to 1889, and the original family pews which back then cost a steep $450. The three Torah scrolls in the Ark survived the Holocaust along with interesting stories that accompanied them. From the original cobblestone street floor in the Lloyd Street Synagogue study hall to the original gas lit chandeliers, little is left to imagine of the European shtetl life. That study hall served the first Hebrew day school in America in the 1840’s, forerunner to the Talmudical Academy of Baltimore in 1917. The museum has old Torah commentaries written in the 1800’s, as well as a matzo oven and separate men and womens’ mikvahs built in the early 1900’s. Built in 1876, the B’nai Israel Synagogue, known as the “Russiche Shule”, still holds Friday night, Saturday and Sunday morning services. Its Moorish architecture, complex woodwork and brass, and the graceful arches reflect our Middle Eastern origins. Its elaborate ivory colored, gold painted wooden Ark, which at first glance resembles the Taj Mahal, was hand carved. It took the artist two years to construct, and the labor, materials, and installation for this magnificent masterpiece amounted to $77. 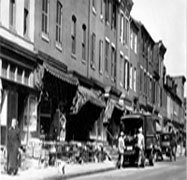 The immigrants from Eastern Europe (1880 - 1920) created a traditional Jewish lifestyle in East Baltimore, where Yiddish “mamaloshon” was spoken, and kids learned in cheder with a rebbe after public school. Shuls, kosher butchers and bakeries abounded. One can trace a continuous line from the early immigrants to today’s Jewish community. Rabbi Abraham Nathan Schwartz founded Talmudical Academy, and subsequently Rabbi Yaakov Ruderman of the Slabodka yeshiva established the Ner Israel Rabbinical College in 1933. Currently Ner Israel hosts 600 students from as far away as South America, Europe, and Russia. Its thousands of graduates have gone on to make invaluable contributions in both Torah and secular fields throughout the world. Yeshiva Lane, a self-contained community within Ner Israel’s campus, houses another 200 post-graduate fellows and their families. Over the years, many of them have established themselves as leaders in the greater Baltimore Jewish community. Undoubtedly, Ner Israel has made a major contribution to Northwest Baltimore’s Jewish demographic growth. Today, Baltimore is home to a dozen Jewish day schools, yeshivas and seminaries, the largest being the Bais Yaakov School for Girls. With approximately 100 observant families moving to Baltimore each year, it recently expanded to a second campus that houses the middle and high schoolers, exclusively. Over the past 50 years, Jewish neighborhoods have migrated from East Baltimore to Northwest Baltimore, with the Jewish shopping district relocating to Reisterstown Road, where it remains today. There you can find Judaic gift and book stores, kosher butcher shops and bakeries, an exclusively kosher supermarket, and several kosher restaurants and eateries featuring everything from bagels, to shwarma, to pizza, to deli, to sushi, to moo goo gai pan! We also have two Dunkin’ Donuts under Rabbinical supervision. Ner Israel was instrumental in saving hundreds of Iranians, by bringing them to the yeshiva to learn. 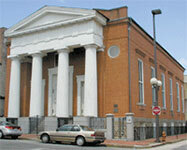 Baltimore’s potpourri of synagogues serves the city’s almost 100,000 Jews. There are nearly 70 synagogues and minyans scattered throughout the greater community, with 30 of them in Upper Park Heights alone. Rabbi Moshe Heinemann, Rabbinic Administrator of the STAR-K, has served as the Rav of the Agudath Israel in Baltimore since it was established in 1981. Today, this bustling Torah center houses well over 100 minyanim weekly, in addition to numerous shiurim. Down the street from the Agudath Israel is Shearith Israel, of the old German custom, dating back to 1851. Baltimore’s Sephardi Jews, mostly from Iran, worship in synagogues that follow their own rich customs. After the shah’s fall in the mid-1970s, Ner Israel was instrumental in saving hundreds of Iranians, by bringing them to the yeshiva to learn. They, too, have married, settled in Baltimore, and are making major contributions to the flourishing of the Baltimore Jewish community, typically as businessmen. Contrary to popular misconception, not every man wearing a black hat and a beard is a rabbi, and not every Orthodox woman is a homemaker. The majority of the observant Northwest Baltimore community is fully engaged in the secular world of academia, government, and commerce. They include doctors and health care workers, lawyers, professors and deans at Baltimore’s prestigious universities, business executives, and employees of federal and state agencies, as well as blue-collar workers and small business owners. Active and accomplished in their professions, they are committed to keeping kosher, observing the Sabbath, volunteering to communal chesed (kindness), and making Torah study the center of their busy day. Baltimore’s Jewish community is known far and wide for its charitable communal organizations. For example: Ahavas Yisroel Charity Fund discreetly delivers food packages to the poor; Bikur Cholim arranges meals and visitation to the sick; the Jewish Caring Network provides help to the terminally ill and their families; and the Hachnosas Orchim program arranges housing for visitors from around the world being treated at the renowned Johns Hopkins Hospital. On Chanukah, multitudes of Menorahs light up Ner Israel and Yeshiva Lane’s windows. Baltimore also features the seasonal “Chanukah House” on Greenspring Avenue. Throngs of kids and kids-at-heart visit Chanukah House to see the latest colorful and vibrant window displays of popular characters celebrating Chanukah. On Chanukah, or any time of year, Baltimore is a shining light on the Jewish map!